Glamorgan Senior and Academy players, together with members of the Cricket Wales Girls and our own Glamorgan Volunteering Team joined forces with The Cardiff Blues and The Gideon Church members to take part in Operation Christmas Child project last night. First team players Chris Cooke, Aneurin Donald, Lukas Carey, Graham Wagg, Owen Morgan, Kieran Bull and David Lloyd all attended the event held in Llantrisant. 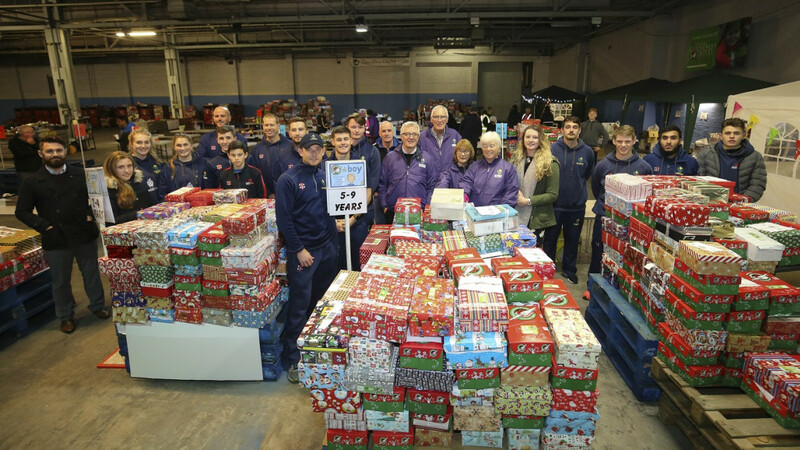 During the evening, the team worked together enthusiastically sorting and processing gift boxes and then packing and loading over 10,000 gift boxes onto vehicles leaving the South Wales depot for a destination in Albania. Glamorgan together with Flying Start helped to donate over 60 shoeboxes of gifts to the cause. “Christmas can be quite an unhappy time of the year for some people that aren’t as privileged as others, so it great to help out and hopefully put a few smiles on children’s faces,” said Chris Cooke. “It’s great to take part in events like this,” added Aneurin Donald. If you would like to be a part of similar projects and help support Glamorgan with their community projects, please contact Bev Boulton for further details and an application form.